T-Mobile has announced that it will soon be bringing a number of new features and enhancements to its Samsung Galaxy S III — one of which will be a virtual preload of Marvel's The Avengers for both new and existing users. The movie will be available to download from the Samsung Media Hub, exclusively for T-Mobile customers, on September 25. In addition to this, T-Mobile will be introducing new features to the handset, including the ability to wirelessly share licensed content, including movies and TV shows, to your HDTV via the Galaxy S III's built-in AllShare Cast feature and the AllShare Cast Wireless Hub. According to T-Mobile, this feature, coupled with its new Unlimited Nationwide 4G Data plan, makes it "easy for customers to stream or download unlimited video content, including their favorite movies and TV shows, without having to worry about data caps, speed limits, or overages." More than 90% of smartphone owners are now using their devices for entertainment purposes, according to T-Mobile, from watching YouTube clips to feature films, playing games, and listening to music. Check out the company's full press release below. BELLEVUE, Wash. — Sept. 20, 2012 — T-Mobile USA, Inc., the No. 1 mobile operator brand in Samsung Galaxy S® sales, and Samsung Telecommunications America, LLC (Samsung Mobile),1 today announced new and enhanced features which will be added to all Samsung Galaxy S® III smartphones at T-Mobile®. 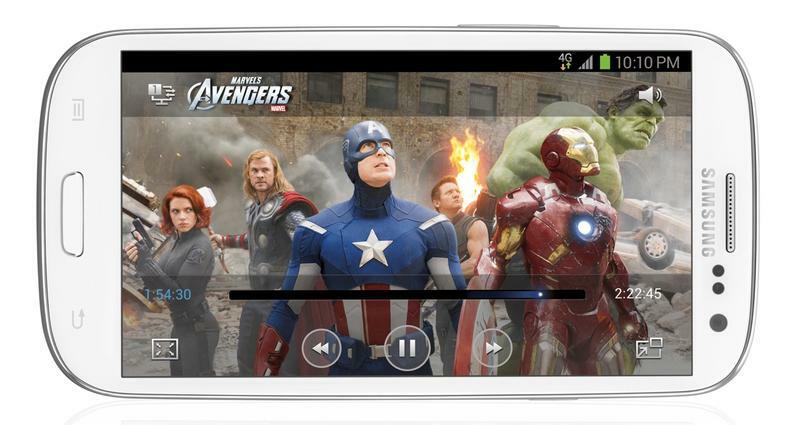 Expanding on the already robust entertainment and sharing features of the top-selling Galaxy S III, new and existing owners of the smartphone will receive "Marvel's The Avengers" – the no. 1 movie of the year and 3rd biggest release of all time – as a virtual preload, available for download in the Samsung Media Hub, only at T-Mobile. In addition, T-Mobile customers will have the ability to wirelessly share licensed content, such as movies and TV shows, to a compatible TV via the AllShare Cast feature and AllShare Cast Wireless Hub. Paired with T-Mobile's new Unlimited Nationwide 4G Data plan, the new features make it easy for customers to stream or download unlimited video content, including their favorite movies and TV shows, without having to worry about data caps, speed limits or overages. With today's on-the-go lifestyle, an overwhelming majority (91 percent) of smartphone owners are using their devices for entertainment purposes for a wide variety of content – from YouTube clips and user-generated videos to feature films, games, music and more. In fact, a recent T-Mobile survey2 found this trend to be on the rise and more than one in 10 (11 percent) surveyed smartphone users rely on their smartphones so much for entertainment that they watch more video content on their devices than on their TVs. "T-Mobile is committed to bringing leading-edge smartphone experiences to our customers by offering new features, including exciting content such as 'Marvel's The Avengers,'" said Brad Duea, senior vice president, product management, T-Mobile USA. "Whether our customers choose to stream or download content directly to their devices or share it to the big screen, as the only nationwide 4G network that offers an unlimited 4G data plan, T-Mobile is making it easier than ever to unleash all that the Galaxy S III has to offer." "We are excited to partner with T-Mobile on this groundbreaking promotion and provide the highest-quality film experience for 'Marvel's The Avengers' to Galaxy S III smartphone owners," commented Dan Cohen, executive vice president, pay television and digital, Disney-ABC Domestic Television. In addition, with a recent software update, Galaxy S III owners will be able to share licensed content, including TV shows and movies from Samsung Media Hub, wirelessly with AllShare Cast to any HDMI-capable TV with the addition of a new accessory, the Samsung AllShare Cast Wireless Hub. The AllShare Cast Hub accessory will cost $99.99 and will be available via https://www.technobuffalo.com/e?link=https%3A%2F%2Ft-mobile.7eer.net%2Fc...">www.T-Mobile.com and in T-Mobile retail stores beginning Sept. 24. To showcase the new features of the Galaxy S III, as well as T-Mobile's full suite of Samsung Galaxy S devices, T-Mobile will introduce the Samsung Galaxy Zone in stores around the country this fall. The new interactive fixture will be rolled out in hundreds of locations and will provide an exclusive, enhanced retail experience for T-Mobile customers. The Galaxy Zone offers customers the opportunity to demo a Samsung device while using two television screens to visually supplement demonstrated device activity, such as AllShare Play, bringing to life the amazing experiences these devices offer. 1 Samsung Mobile is the No. 1 mobile phone provider in the United States according to Strategy Analytics, North America Handset Vendor Marketshare, Q2 2012. 2 About The Survey The T-Mobile Smartphone Screen Survey was conducted between May 29th and June 5th, 2012 among 1,031 Americans ages 18 and over who own a smartphone, using an email invitation and an online survey. Results of any sample are subject to sampling variation. The magnitude of the variation is measurable and is affected by the number of interviews and the level of the percentages expressing the results. In this particular study, the chances are 95 in 100 that a survey result does not vary, plus or minus, by more than 3.1 percentage points from the result that would be obtained if interviews had been conducted with all persons in the universe represented by the sample. The margin of error for any subgroups will be slightly higher. Kelton is a leading global insights firm serving as a partner to more than 100 of the Fortune 500 and thousands of smaller companies and organizations. Utilizing a wide range of customized, innovative research techniques and staff expertise in marketing, branding, PR, media, and business strategy; Kelton helps drive our clients' businesses forward. 3 Data rates apply unless downloaded via Wi-Fi. Samsung, Galaxy, Galaxy S and Super AMOLED are trademarks of Samsung Electronics Co., Ltd. Other company names, product names and marks mentioned herein are the property of their respective owners and may be trademarks or registered trademarks. Based in Bellevue, Wash., T-Mobile USA, Inc. is the U.S. wireless operation of Deutsche Telekom AG (OTCQX: DTEGY). By the end of the second quarter of 2012, approximately 130 million mobile customers were served by the mobile communication segments of the Deutsche Telekom group — 33.2 million by T-Mobile USA — all via a common technology platform based on GSM and UMTS and additionally HSPA+ 21/HSPA+ 42. T-Mobile USA's innovative wireless products and services help empower people to connect to those who matter most. Multiple independent research studies continue to rank T-Mobile USA among the highest in numerous regions throughout the U.S. in wireless customer care and call quality. For more information, please visit http://www.T-Mobile.com. T-Mobile is a federally registered trademark of Deutsche Telekom AG. For further information on Deutsche Telekom, please visit http://www.telekom.de/investor-relations.